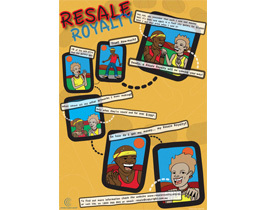 Resale Royalty Scheme Review – Only One Week to Go! at News Aboriginal Art Directory. View information about Resale Royalty Scheme Review – Only One Week to Go! The Copyright Agency Ltd (CAL) administers the scheme which collects royalties for artists on eligible resales of their works. Since the scheme was launched in June 2010, it has generated more than $1.5 million in royalties for 650 artists, 68% of whom are Aboriginal or Torres Strait Islander - though they've only received 51% of the royalties paid. More than 6,800 resales have been involved and approximately 90 per cent of royalty payments were made to living artists – though the dead received 24% of the royalties, including the highest payout on record, $50,000. Resales, of course, are primarily in the hands of the auction houses. It has not been boom time for them – especially in indigenous art sales, which peaked at $28.5 million in 2007, falling to $10.1 million in 2010 and $8.2 million in 2012.
the identification and consideration of any revisions to the Act or regulations that could enhance the operation of the scheme. This is your opportunity to provide feedback on how the scheme is functioning and whether you think it is supporting Australia’s visual arts sector. It is important that the review includes input from a range of individuals and organisations, so the Government encourages you to have your say. Submissions close 12 July 2013.